DESCRIPTION A Two Bedroomed Detached Bungalow, situated within this popular residential area of Glebe Park to the north of the City of Lincoln. The property is in need of some modernisation and has living accommodation briefly comprising of; Entrance Hallway, Lounge/Diner, Kitchen, Conservatory, Two Bedrooms and Bathroom. Outside there are gardens to both the front and rear and a driveway providing off-street parking, which gives access to a Detached Single Garage. The property further benefits from uPVC double glazing and gas central heating and is being sold with NO ONWARD CHAIN. The historic Cathedral and University City of Lincoln has the usual High Street shops and department stores, plus banking and allied facilities, multiplex cinema, Marina and Art Gallery. The famous Steep Hill leads to the Uphill area of Lincoln and the Bailgate, with its quaint boutiques and bistros, the Castle, Cathedral and renowned Bishop Grosseteste College. ENTRANCE HALLWAY With uPVC double glazed window and external door to front elevation, radiator, airing cupboard housing hot water cylinder and doors leading to Lounge/Diner, Kitchen, Two Bedrooms and Bathroom. LOUNGE AREA 13′ 9" x 12′ 8" (4.19m x 3.86m) With uPVC double glazed window to front elevation, fire surround and hearth with gas fire inset, wall lighting, radiator and opening to Dining Area. DINING AREA 10′ 5" x 8′ 7" (3.18m x 2.62m) With uPVC double glazed sliding doors to rear elevation and radiator. KITCHEN 10′ 8" x 8′ 8" (3.25m x 2.64m) With uPVC double glazed window to rear elevation and fitted with a range of wall, drawer and base units with work surfaces over and tiled splashbacks. Stainless steel sink and drainer with mixer tap, space for oven and fridge freezer, plumbing and space for washing machine, partly-tiled walls, radiator and uPVC double glazed door to Conservatory. CONSERVATORY 12′ 4" x 7′ 9" (3.76m x 2.36m) With brick base and uPVC double glazed surround, tiled flooring and double doors into garden. BEDROOM 1 11′ 8" x 10′ 2" (3.56m x 3.1m) With uPVC double glazed window to front elevation and radiator. 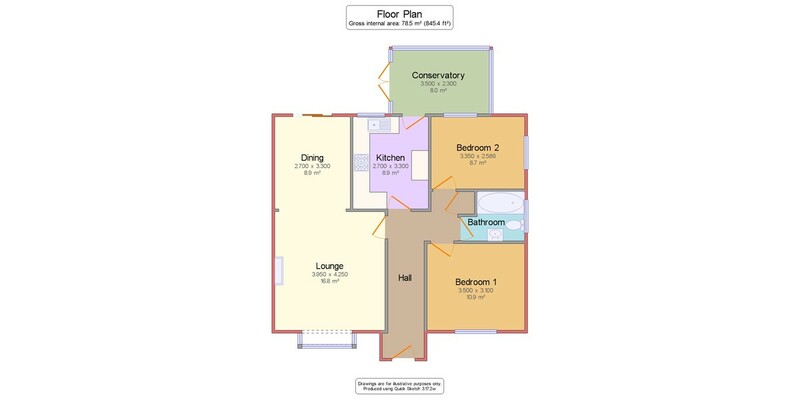 BEDROOM 2 10′ 9" x 8′ 1" (3.28m x 2.46m) With uPVC double glazed window to rear elevation and radiator. BATHROOM With uPVC double glazed window to side elevation and suite to comprise; low-level WC, wash hand basin and bath, partly-tiled walls and radiator. OUTSIDE To the front of the property, there is a paved area with a range of plants, shrubs and trees and a block-paved driveway to the side, providing off-street parking with gates leading to the detached single garage. To the rear of the property, there is patio seating area, lawned garden and garden shed.